Two communications satellites to cover Europe, Africa and Japan were delivered to a spot-on orbit Thursday by an Ariane 5 rocket. 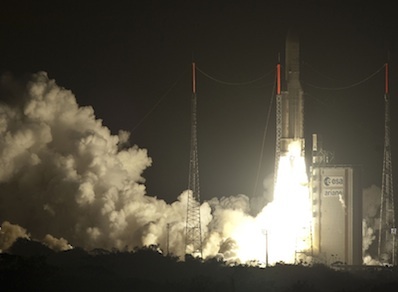 Flying for the fourth time this year, the Ariane 5 successfully launched the W3B communications satellite and the BSAT 3b high-definition television broadcasting spacecraft for Eutelsat of Paris and the Broadcasting Satellite System Corp. of Tokyo. The bullet-shaped launcher ignited its hydrogen-fueled engine at 2151 GMT (5:51 p.m. EDT). Seven seconds later, two solid rocket boosters fired to propel the 166-foot-tall vehicle into the evening sky over the Guiana Space Center, a sprawling facility on the northeast coast of South America. The Ariane 5 pitched east from the launch pad, darting into a dark sky and through scattered clouds before surpassing the speed of sound 41 seconds after blastoff. Both solid rocket boosters jettisoned 2 minutes, 15 seconds into the mission. The aluminum nose shroud separated less than a minute later, exposing the flight's payloads once the rocket exited the lower atmosphere. The Vulcain 2 main engine shut down and the first stage separated about 9 minutes after liftoff. The upper stage's HM7B cryogenic engine started up a few seconds later and fired for nearly 16 minutes, accelerating to nearly 21,000 mph. The rocket released the 11,839-pound W3B spacecraft at the flight's 28-minute point, then oriented itself to separate the Sylda dual satellite adapter and BSAT 3b. Deployment of the 4,542-pound BSAT 3b satellite occurred nearly 38 minutes after liftoff, extending the Ariane 5 success record to 39 in a row. The Ariane 5 rocket dropped the satellites in a geosynchronous transfer orbit with a high point of 22,312 miles, a low point of 155 miles and an inclination of 2 degrees. Both satellites will use on-board engines to raise their orbits to an altitude of about 22,300 miles in the next several days. The craft will also unfurl solar panels and communications reflectors. 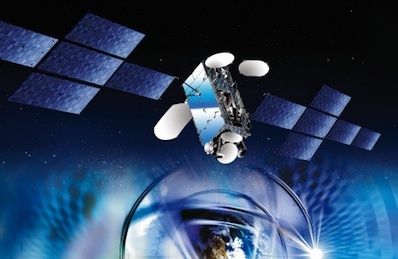 Built by Thales Alenia Space and based on the Spacebus 4000 C3 platform, Eutelsat's W3B satellite will complete functional testing and be commissioned in December. 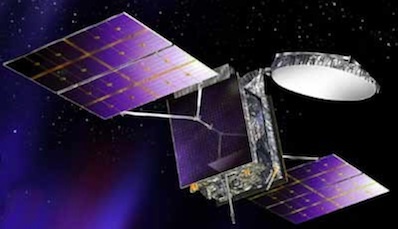 Satellite contractor Lockheed Martin will also hand over control of BSAT 3b to its operator in December. W3B is destined for geosynchronous orbit at 16 degrees east longitude, a prime location to broadcast television and video programming to Central Europe. "It is the first of seven satellites that will join our fleet by early 2013 to drive the continuing growth of our activity," said Michel de Rosen, CEO of Eutelsat." W3B's capacity will replace the aging Eurobird and SESAT 1 satellites. The new craft was dispatched to 16 degrees east to also replace the W2M satellite, which failed one month after launching in December 2008. Eutelsat switched W3B's launch from a Chinese Long March rocket to an Ariane 5 in February. The change permitted Thales to incorporate U.S. parts on the spacecraft, ensuring it could launch this year after potential production delays stemming from an earthquake that struck the company's satellite construction facility in Italy last year. U.S. arms regulations prevent American satellite parts from launching on Chinese rockets. Eutelsat assigned another communications satellite named W3C to fly on the Long March rocket in 2011. W3B will be moved from the 16 degrees east slot to 7 degrees east longitude after W3C is in orbit. The craft's 56 Ku-band and Ka-band transponders are optimized for direct broadcasting to Europe. A spot beam will be steered toward Madagascar and other Indian Ocean islands for direct broadcasting services, according to Eutelsat. Another beam will provide data and Internet to sub-Saharan Africa. The new bandwidth for Africa will "help drive economic and social development," de Rosen said. Its total coverage area encompasses Europe, Africa, the Middle East, Asia and the Indian Ocean. It is designed to operate for 15 years. "It is a magnificent, flexible and complicated spacecraft that will provide tremendous services to our customers," de Rosen said. "We have customers for the satellite from the North Pole to the South Pole, and thanks to that spacecraft, they will have access to TV services and also to broadband." BSAT 3b will broadcast high-definition television to homes and businesses throughout Japan from 110 degrees east longitude. The satellite will link ground stations with 90 million HDTV terminals across the country, according to Kazuo Takenaka, president of B-SAT Corp.
"BSAT 3b will play a vital role providing satellite broadcasting services for millions in the Japanese public for many years to come," Takenaka said. The satellite is based on Lockheed Martin's A2100A platform, and its design life is 15 years. It carries 12 Ku-band transponders, eight of which will operate at one time. Lockheed Martin is building another satellite named BSAT 3c, which is scheduled for launch in the second quarter of 2011 on another Ariane 5 rocket. Arianespace has accomplished four dual-payload launches so far this year. "With this evening's success, we already have launched eight large telecommunications satellites since the beginning of 2010, which is more than all of our competitors combined," said Jean-Yves Le Gall, Arianespace chairman and CEO. Two more satellites, Intelsat 17 and HYLAS 1, are scheduled to launch Nov. 25 on an Ariane 5 rocket. Spanish and Korean payloads will blast off in December on the last Ariane 5 of the year.